This quilt has been such fun to make. Inspired from the two mini’s I have recently completed. I added a vertical and horizontal piece to the blocks. 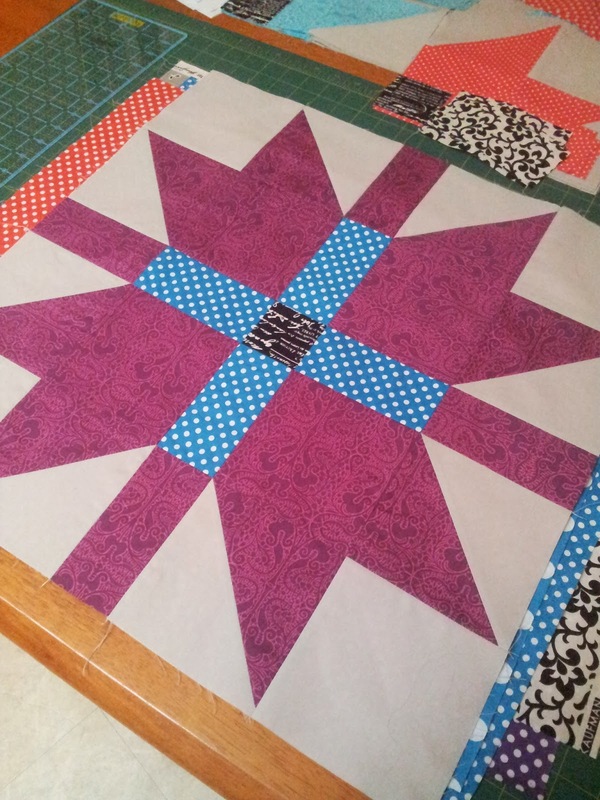 I then also made the block large, finishing at approx 20 inches square. The block looks like wrapped and ribboned parcels. Fabric was pulled from my stash, and I also added some FQ’s gathered on a trip to GJ’sin Lygon St. The back ground is all Kona Ash. My bolt is almost gone … time to order another! I wanted to really stretch myself with this quilt. I can happily stitch a stipple all day, but a different design was needed for this. I watched some videos (Thanks Ebony) and chatted to some online friends, and decided to go with a spiral design in the grey areas. I learnt that stitching in the ditch can be done without rulers, albeit roughly. If you use similar thread this is not really that noticeable. I also learnt how to move in and out of my spirals and move around the quilt top. My quilting is more dense towards the end, however this is something that I can work on. I quilted wiggly lines in the coloured sections of the blocks, and pebbles in the black centers. Backing is a purple wideback, also gleaned whilst at GJ’s from the discount bin. The binding is scrappy strips from the leftovers. It nicely frames the quilt top. The quilt is a gift for the wonderful lady who takes my daughter to school and back, every day. I cherish all that she does for me and our family. I love that I can gift something in return for all she does for us. Wrapping to deliver and put under their tree for Christmas morning. Caz, what a wonderful gift! She will love it. Your quilting looks great. What a fabulous gift to give, great quilting!! You did a great job with the quilting! Love the quilt!